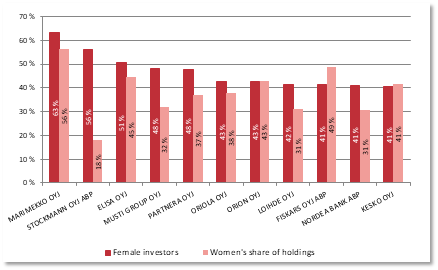 The following statistics shows shareholders and holdings between male and female investors. 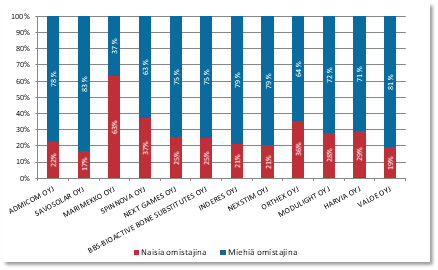 Only publicly listed Finnish companies are included in this statistics. Gender has been identified for shareholders who have a Finnish personal ID. Shareholders in this statistics belong mainly to the household sector. Also foreigners living in Finland who have a Finnish personal ID are included in these figures. Other natural persons with no personal ID are excluded. The following statistics shows 12 publicly listed Finnish companies with most household shareholders. The statistics shows also the number of shareholders divided into male and female investors. 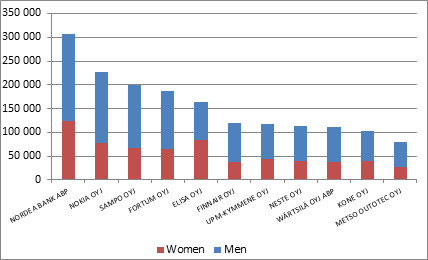 The following statistics shows 12 publicly listed Finnish companies which are most popular among female investors. 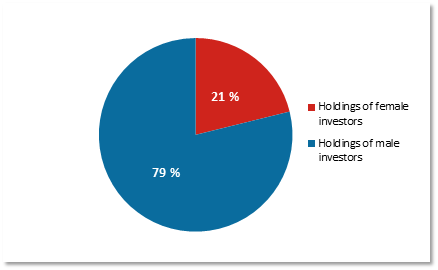 The statistics shows the proportion of female investors in relation to all household investors and holdings. The following statistics shows 12 publicly listed Finnish companies which are most popular among male investors. 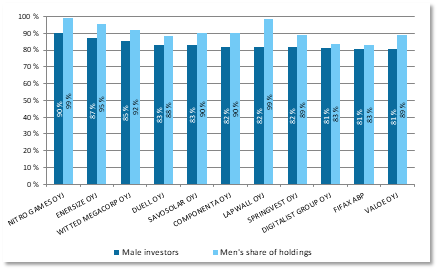 The statistics shows the proportion of male investors in relation to all household investors and holdings. 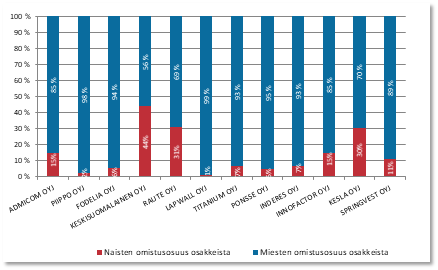 The following statistics shows 12 publicly listed Finnish companies which has most household owners in relation to all owners in the company. The statistics shows the proportional number of male and female investors separately. The following statistics shows 12 publicly listed Finnish companies in which household owners have most holdings in relation to all holdings in the company. 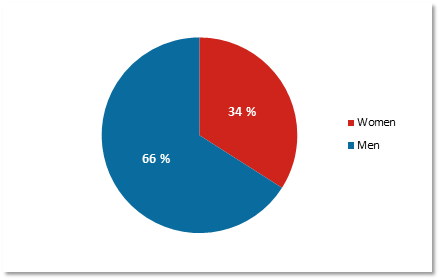 The statistics shows the proportional holdings of male and female investors separately.